This is an interesting way of using an image and objects that are already out there. 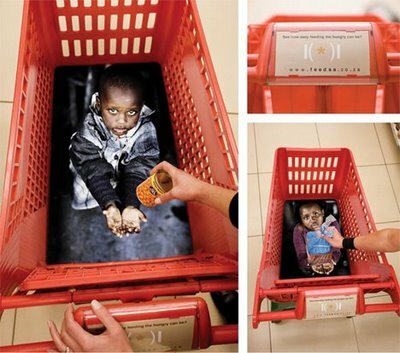 This campaign works really well because its constantly with you while you are doing your shopping. It will stop and make you think which is interesting. With regards to my project this is a great idea for illustrating the women are trapped and you can help them by using the basket as the cage. This could easily become a range of images, for example the billboard designs transferring into shopping baskets etc, it could become a very viral campaign.